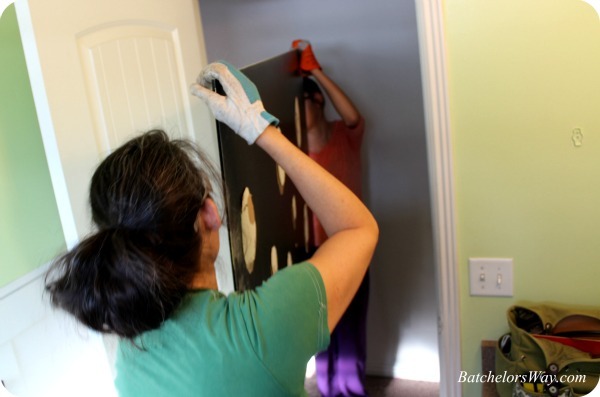 Batchelors Way: It begins, Taking down the mirror. It begins, Taking down the mirror. Let's dive into this remodel. I told you one of my highest priorities for this bathroom remodel was to add storage. 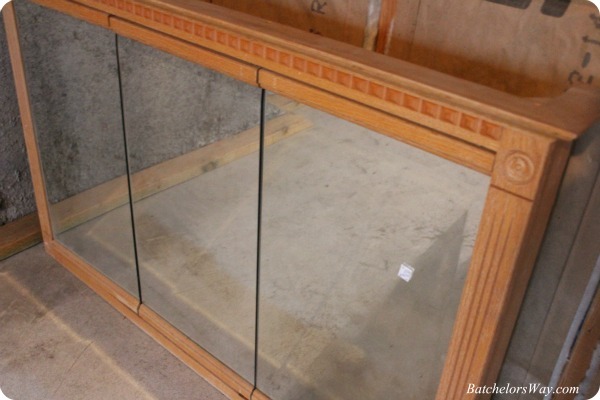 I wanted a medicine cabinet that could store stuff. I found this cute medicine cabinet. It was a decent size; 45"x30". 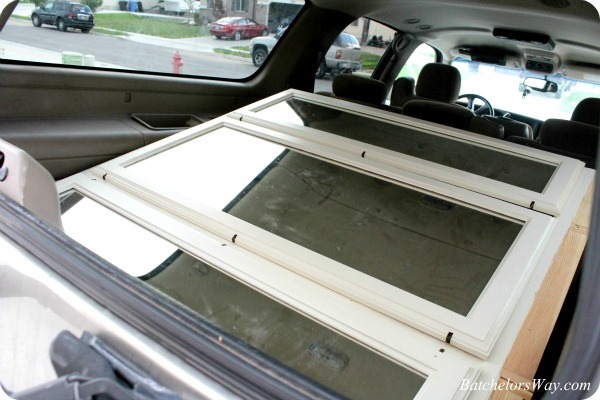 This was the plan until one day Les and I stumbled across a huge three mirror medicine cabinet at the Restore. You may remember my post, I should not be allowed in the Restore! But first we had to get this builder grade mirror out of the way! I know that a huge mirror is nice in a bathroom, but it gives you no storage!!! Am I the only one who has stuff to store in the bathroom? Come on, this is poor planning!! Alright, on to how we went about taking this baby off the wall! 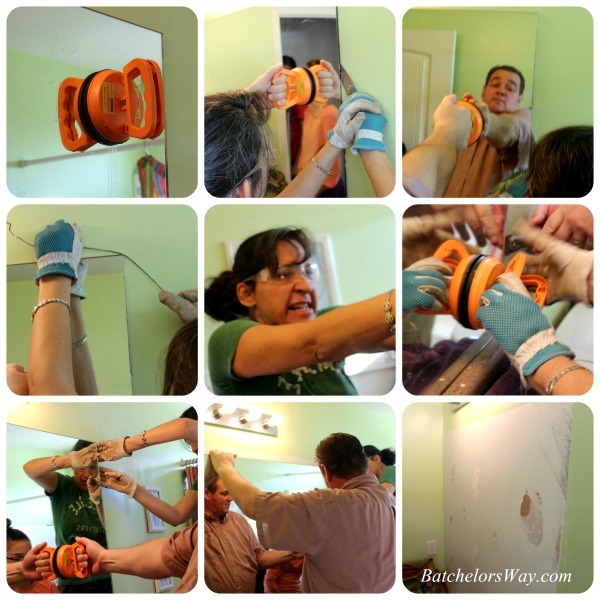 We used a dent puller and suctioned it to the mirror to help pull it off the wall. This helps prevent from breaking the mirror. We also used a very thin sharp saw to try and cut through the glue on the back. A wire also works well to try and cut through or break the glue. Just thread it behind a corner of the mirror and work it down. Oh, and it helps to make faces as you pull and grunt!! 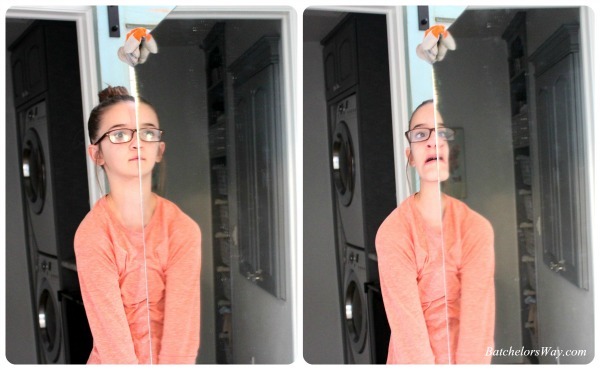 Eventually you will get the edge of the mirror free, and after a little more effort the whole thing pops off. We've done this twice now and haven't broke one yet. Ashlee and I carried this big mirror out and since we were fortunate enough to get it out in one piece, you know we had to reuse it!! We used it in Ashlee's room. Go see how it turned out at, What to do with a Builder Grade Mirror. Those are the big glue spots that we had to cut through. All work and no play is just not good!! Next we will tackle cutting a hole in the wall to set our huge medicine cabinet into!! I am right there with you about having storage. I don't have but a few medicines...but I sure would like a medicine cabinet to store them and my essential oils. I have been trying to come up with a way to add a small one to my bathroom. I want that medicine cabinet! 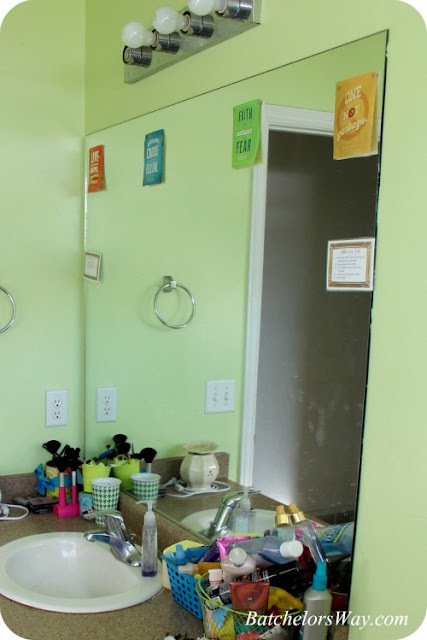 I have a similar bathroom setup and two girls sharing (luckily they are still babies...) who will eventually need the storage. Do you know the brand of the mirror?